Vitamin D is one of the most important vitamins, and one we are most likely to be deficient in as Americans. Some estimates say anywhere from 80-90% of the population may have sub optimal levels of Vitamin D in the blood. This is worrying because Vitamin D plays such an important role in health. From reducing autoimmune issues and inflammation, to preventing disease, Vitamin D is a nutrient we shouldn’t neglect. Here are 3 important reasons to make sure you’re getting enough, and even supplement if you are at risk for deficiency. The major reason to supplement with Vitamin D is its importance in the immune system- with everything from upper respiratory infections to cancer. Vitamin D has a protective effect on the immune system, helping T-cells and B-cells to to fight immune threats while also preventing autoimmune issues. Several autoimmune diseases (including Lupus and MS) have a high range of deficiency and supplementation with Vitamin D has been shown to improve health in these individuals. Having sufficient Vitamin has been shown to reduce upper respiratory infections in both summer and winter. Those with deficiencies of Vitamin D are found to suffer from upper respiratory infections much more often, even accounting for the seasons. Fun fact: before they knew about Vitamin D, tuberculosis patients were sent to sanitariums. They were prescribed lots of sunlight which they believed cured the tuberculosis. People have also taken cod liver oil for ages for its health benefits. Cod liver oil is a great source of Vitamin D.
Vitamin D also reduces inflammation in the body, making it important for people with many health conditions like diabetes, infertility, autoimmunity, or metabolic syndrome. It’s a well accepted fact in the medical community that Vitamin D is just as important for bone health as calcium because of the role it plays as a calcium cofactor. Vitamin D helps maintain calcium homeostasis in the body. That’s why so many calcium supplements now also have Vitamin D.
Vitamin D promotes mineralization of the collagen matrix in bone. Both women and men commonly don’t get enough calcium or Vitamin D through the diet and may need to consider supplementation. Another important Vitamin for bone health, and still relatively unknown, is Vitamin K2. Many supplements don’t contain all three and may not be as effective. The last and best reason to supplement with Vitamin D is that it promotes happiness and emotional stability. It is very common for people to feel sad, depressed, or anxious during the winter and to feel happier in summer. Likewise, those who work outside or have ample sunshine time during the day report happier moods than those stuck in dark offices all day. There’s something to this besides the fun of swimming and eating ice cream. 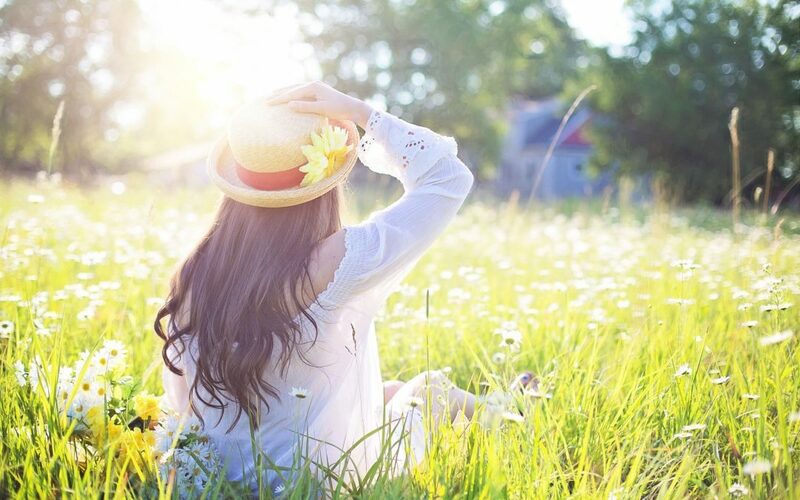 Vitamin D, the sunshine vitamin, is primarily processed through the skin rather than through food. During the summer, we wear less and tend to spend more time outdoors, and this increases the amount we produce. In turn, we get sick less often and feel altogether happier. Vitamin D deficiencies are associated with lower mood and decreased cognitive function. Since Vitamin D is a fat soluble vitamin, it’s important not to take too much, since the body does store some. However, Vitamin D needs range depending on specific conditions. Recommendations for average adults age 19-50 are about 600 i/u a day to prevent deficiency. This can come from sunlight, diet, or supplements, but it may take up to 1500 or 2000 i/u a day, depending on the individual, to keep blood levels about the recommended 30 ng/ml. Obese individuals, those with active infections, or those taking certain medications may need twice as much Vitamin D. Excess fat actually shuffles Vitamin D into the fat so that the body cannot use all of it. Many in the natural health community recommend even higher levels. They probably have a point since with the use of sunscreen, we may not be getting enough Vitamin D even during summer and food provides relatively little. A Vitamin D blood test is relatively inexpensive and easy to order. I’d recommend asking your doctor to run it the next time you have blood run so you can see where you’re at. Also recommended is to get at least 30 minutes of direct sunlight to a majority of skin per day. If that’s not possible, I recommend taking a supplement like this one which contains Vitamin D, A, and K, all necessary cofactors. Find it here. Be careful if you also take other supplements or a multivitamin as these often contain Vitamin D as well and make sure you aren’t taking too much. When looking for a vitamin D supplement, look for Vitamin D3, the form that is best absorbed by the body. Do you take Vitamin D? How has it helped you? I have been taking Vitamin D about 2000 IU’s per day. Recently ran out and would like to buy a better quality supplement than what you can pick up at Walmart. Any suggestions?